Senator Daniel K. Inouye of Hawaii, President Pro Tempore of the U.S. Senate, World War II hero, and Congressional Medal of Honor recipient, passed away on December 17, 2012 from respiratory complications at the Walter Reed National Military Medical Center in Washington, D.C. 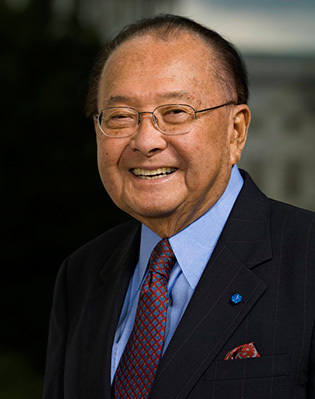 Senator Inouye has served the country with distinctions and a widely regarded reputation for honor and integrity. He was a distinguished statesman, a national voice of conscience, and a compelling champion of social justice. As the highest ranking elected official of Asian American heritage in U.S. history, the Senator has been an inspiration to generations of Asian Pacific Americans. We at the Asian American Federation are grateful for his unwavering service to his state, country and fellow citizens. We especially thank him for his support of our mission and for having served as Chairman of our Honorary Board. He and his wife Irene, who was honored by the Federation in 2009, are great examples of generosity, humility and dedication, and we thank them for their legacy.